Feb. 20, 2018 - Northland Forest Products is a family-owned sawmill nestled among the oilsands giants in northeastern Alberta. In spite of the challenges of operating in the shadow of oil and gas, Northland is thriving. Within the past three years the company purchased Millar Western’s sawmill operations in Boyle, Alta., shook hands with Alberta-Pacific Forest Industries to integrate fibre supply, and upgraded to an impressive HewSaw curve sawing small log line. These moves have allowed the mill to post a 2017 output of 75 mmbf. Resilience is in Northland’s DNA. Less than two years ago the mill survived the harrowing experience that was The Beast – the media-dubbed nickname for the Fort McMurray wildfire in May 2016 that consumed more than 575,000 hectares of forest and about 2,400 buildings in the municipality. Read about their experience of the fire here. The mill is owned and operated by two brothers – Howie Ewashko who is the president of Northland and Craig Ewashko who is in charge of mill operations. Sister Kim Norris is Northland’s health and safety co-ordinator. The family’s sawmill story begins with the Ewashko’s father, Roy, who opened a mill in Berland River near Whitecourt, Alta., in the early 1960s. The family relocated to Fort McMurray in 1964 to take advantage of quota opportunities. Northland Forest Products first opened as a portable mill in 1970 by Roy and a partner, who was bought out by Roy and his wife, Bev, a year later. It became a stationary mill in 1975 and was relocated to its present site in 1981. Howie and Craig bought Northland from their parents in 1997. Today, the mill employs 60 people and runs one shift to produce 300,000 bdft a day. They use 100 per cent of the wood fibre hauled into the mill – 300,000 cubic metres of spruce, pine and fir. CFI toured Northland in October to see its upgrades first hand. In 2017 the mill installed a brand-new HewSaw curve sawing small log machine. The new line replaced a HewSaw from 1998 – one of the first HewSaw’s in Canada. 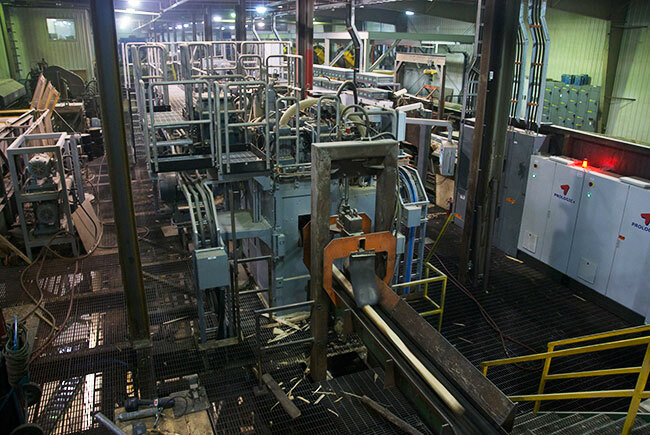 In 2003, the mill upgraded the line with a log turner and scan conveyor. “We saw the advantages immediately on that upgrade so with our comfort level and the expertise of HewSaw we were confident going with them with a new machine,” Craig explains. The new HewSaw R200 A.1 with Prologic+ controls and optimization includes separate edging tools that have been ideal for running 4- to 12-inch diameter logs. “For those sizes we’re able to get quite an uplift in recovery without the board edger being utilized. It’s a finished product with a single pass,” Craig says. The new line bumps up feed speed to 600 feet per minute (with capability of 650) from 450. “It’s instantaneous benefits for sure. The original machine was 20 years old and by no stretch was it worn out. But with the newer technology and the higher speeds it was a necessary step to take for us, especially with our focus on smaller diameter logs in the future,” Craig says. Along with the HewSaw the mill runs an Optimil four-sided canter with optimization from USNR. The Optimil runs about 3,500-4,000 stems per shift and the HewSaw about 10,000. Products from both lines are 1×4, 1×6 and 2×3 to 2×12. Northland uses all of the fibre that enters the mill so handling oversized logs is a Kodiak wideband horizontal sawmill. 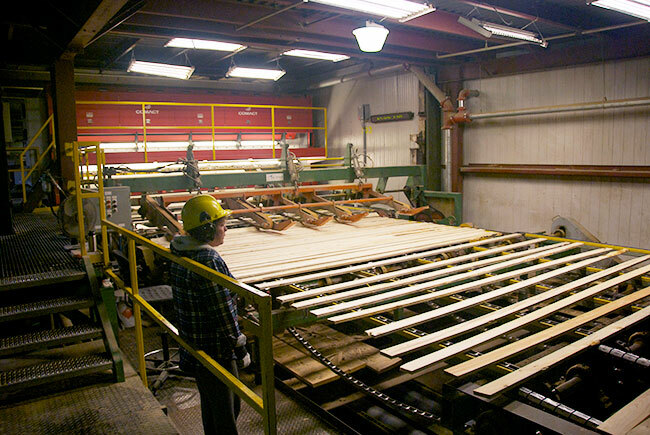 In 2016 Northland upgraded one of its two tree-length infeeds, replacing a lineal bucking saw with a four-saw merchandizer. Craig worked closely with Nanaimo-B.C.-based Gerhardt Mueller to design and install the moving saws in the mill. 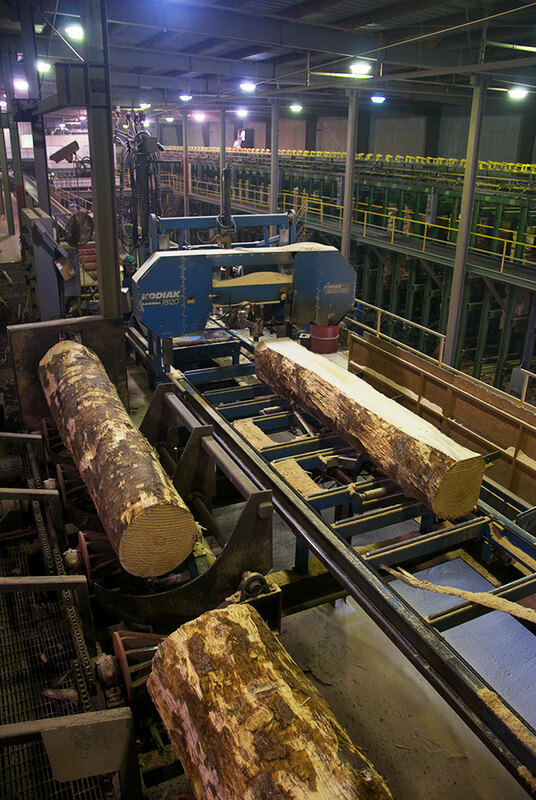 Tree-length logs are scanned and the saws move into position for optimized cuts lengths. With the new HewSaw and previous upgrades, the Ewashkos are confident their 2018 production will reach their target of 100 mmbf. Northland purchased Millar Western Forest Products’ Boyle operations in late 2015. The mill itself was already on the chopping block by Millar Western, and the doors officially closed shortly after the sale. The $30-million deal gave Northland a significant boost in timber supply area, bringing its total up to 500,000 cubic metres. Northland is now the largest quota holder on the Alberta-Pacific Forest Industries’ (Al-Pac) forestry management area, which covers about 6.37 million hectares from Fort McMurray south and east to the Alberta-Saskatchewan border. “Most of our logging is wintertime up here when the river crossings are frozen,” says David Harman, director of business development and forestry for Northland. Two contractors – Tchir Forest Products and Jaward Developments, both out of Lac La Biche, Alta. – harvest about 130-160,000 cubic metres of conifer for Northland. Approximately 80-100,000 cubic metres is incremental volume from Al-Pac. Northland has always had a positive relationship with Al-Pac – the owners of a pulp mill near Boyle, Alta. The mill has supplied Al-Pac with wood chips since 1992. In 2016 the companies signed a memorandum of understanding to work together to optimize fibre supply in the forest management area. 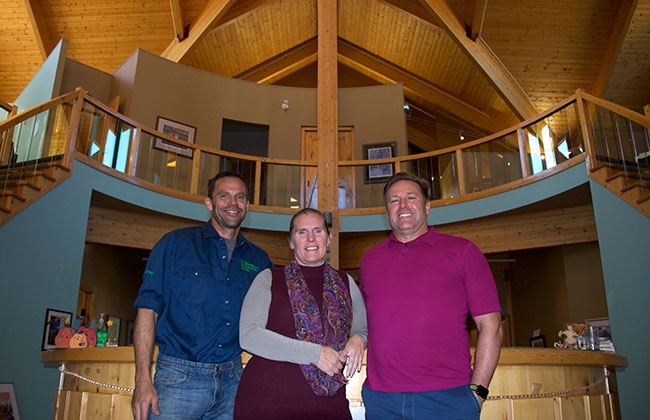 Being located in the heart of the Alberta oilsands has created unique challenges for Northland Forest Products. At the moment they employ about 60 people but it has been a challenge to fill those positions in the past, Howie says. Housing prices in Fort McMurray follow the oil booms and busts, as do staff shortages. “There’s a reality to trying to operate in the shadow of oil and gas, and it doesn’t make life easy; it makes it interesting,” Howie says. One of their strategies to deal with worker shortage was to sign up for a foreign worker program. “We were one of the first sawmills to go into that market for labour and that’s worked out very well for us. We have some long-term employees out of that program who have become Canadians and stayed with us. That really helped us continue operations,” Howie says. The mill’s location, a 15-minute drive north of town, makes it an attractive option for locals who want to be home at night. Many oil and gas sites require employees to stay in camps. “We try and offer lifestyle,” Howie says. The past two years of acquisitions and partnerships have been ground breaking for Northland and have set the company on an impressive upwards trajectory. The future is looking brighter than ever, Howie says. Editor’s note: David Harman passed away peacefully in Fort McMurray on Tuesday, Nov. 28, 2017. From all of us at CFI, we offer our sincere condolences to Dave’s family and colleagues at Northland Forest Products.